The Journal has a very good and interesting report out today by Mark Douglas, that a senior member of the squad, said to be Newcastle captain Fabricio Coloccini, has been given assurances by Mike Ashley, that significant funds will be made available this summer to rebuild the Newcastle squad. The Newcastle squad certainly needs rebuilding with a number of players set to leave Tyneside this summer. Mike Ashley has been at the Benton Training grounds recently, and is said to have had dinner with Fabricio before he left for his trip to Florida, over here in the states. And Mike is said to have assured the Argentine International that funds will be made available and the squad will be significantly strengthened in the summer. Of course Fabricio still has a decision to be made himself, so the dinner was also probably an attempt by Ashley to have Fabricio stay at the club for the remaining two years of his contract, and lead Newcastle forward. And it seems the owner is trying to calm things down a bit on Tyneside, at least with the players, although Alan Pardew’s future is still up in the air, and it could be decided on the result on Saturday against Cardiff City. And to make things even more complex the Chronicle has today lodged an out-and-out attack on Alan Pardew, and also some fan organization(s) are asking that fans walk out of St. James Park after 60 minutes on Saturday as a protest. So one thing we know about that – it’s not going to help the side win the game – that’s for sure. And what happens if Newcastle are leading in the game after 60 minutes? Alan Pardew’s fate will be decided when the season ends – but Newcastle must have a decent chance of beating Cardiff City on Saturday. And why wouldn’t the fans support the team and try to get what could turn out to be a valuable 3 points against Cardiff City and cement Newcastle’s place in the top ten for the season? I will walk out on 60 mins regardless. Best attempt of any to actually make a visible protest at least. Just hope it’s seen as a protest against the regime and not just Pardew. The time for thinking about getting fit for summer is over! Since Ciaran’s oh so endearing recruitment drive has again ended in complete failure, maybe it’s about time they assigned an effective liaison for this blog instead? Rather than help steer me into more active participation I now feel a distinct disregard for those championing MAOC etc. as a result. Well done son. Why would a walkout necessarily harm the sides chances on the day. The players aren’t mugs, and isn’t there more at stake here than three lousy points at this stage of the game. Best thing I’ve heard in ages. 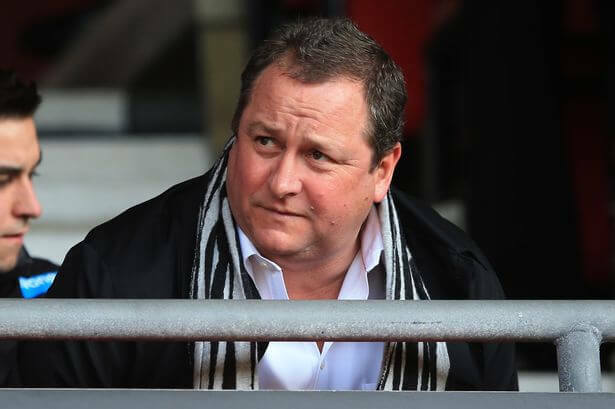 “Mike Ashley has been at the Benton Training grounds recently, and is said to have had dinner with Fabricio before he left for his trip to Florida, over here in the states. Fabricio and Mike, sitting down to a plate of pasta, having a good ole convo’ about future transfers etc. You have to laugh. To be fair, walking out on 60 mins is a really crap idea. Hows about just turning your back on AP when he appears, or chanting ‘Out’ when he shows his smug face? Watch it Fabriccio – King Kevin warned everyone that basically they are a bunch of liars.If you want to go back to Argieland the feel free mate. Ed Harrison, who cares about whether the walk-out has an impact on Saturday’s result or not? We have all known for some time that Newcastle United will not be relegated or qualify for Europe. So we are playing for NOTHING. Consequently, shift your focus from the short-term to the long-term. If we are to move forward we need a new manager. Ashley could invest in Tevez and Mascherano in the summer and we could still be in a relegation fight next year under Pardew’s management. If a win against Cardiff City (relegation candidates), first win in seven games, is enough to cement Pardew’s future in the dug-out of St James’ Park for the next 6 years (or even another single match), then clearly, around 90% of our fans (including me) will want us to lose to Cardiff. Additionally, not renewing/buying season tickets and not purchasing any single tickets next season will accelerate Ashley’s departure. Until Ashley and Pardew are gone, the only way to support Newcastle United is to not support Newcastle United. It really isn’t that complex. Wonder if the miami trip was any good? Cut your nose off to spite your face you mean? Read the comments by Bobby Robson regarding ‘What is a football club’ on the top right of the page, and inwardly digest the information. For the record regarding the protests and boycotts. MA has got the message, he simply doesn’t care. I’m in no doubt that there’s a weird alliance between Pardew and Ashley and I’m in no doubt that Ashley deserves his fair share of criticism for the issues that surround this club. As I’ve said many times, I believe his main failing is not appointing an experienced football person to run this club, instead appointing inexperienced people (DW, JFK, DL) or trying to run it himself. That led to the biggest crime of alienating the fans. But as Martoon said, Ashley isn’t going anywhere until he chooses to. Pardew on the other hand…has a good squad but not only has underperformed this year (in my opinion) but hasn’t even compensated that with derby wins, cup runs or exciting football. I see no point in continuously raging against the regime when we would be better focussed to unite to demand smaller changes that are more easily achievable. Very well said! And a message I’ve tried to put across multiple times. You don’t like MAOC because I asked you, other than click a ‘like’ button what have you done? Is that because you’ve done nothing yet you’re the one on your high-horse. At what point – when it becomes abundantly clear that MA is not concerned with making these small changes these fans think is so achievable – do fans start looking at the man who is really at fault here? …of course Ashley is to blame. He owns Newcastle and he won’t sack Pardew. And surely we should be doing better both in terms of results and performance? I have a question. I see a lot of comments along the lines of “Removing the manager is achievable, whereas removing the owner is near on impossible” – to be clear, not an exact quote – My question is, at what stage do we put more focus on the owner and actually try to do something, even if it does seem we have little chance? For instance, let’s say Ashley does fire Pardew and then hires someone like, Kinnear? Maybe a bit too much of an extreme example, say Alan Curbishley? For me, that would indicate no change at all really, but would people take that as Ashley trying and be willing to give this new manager say 2 years to make an impact at the club? Quick, run, before we’re suspected of being the same person! Pardew is a symptom, just because he is a symptom of the wider issue that is MA does not absolve him of accountability. Jesper…Pardew is surely accountable AND a symptom? You could say the same about getting rid of Ashley, at what point are people going to realise he couldn’t give a monkeys if people protest. You say he doesn’t like criticism which is why he banned the local papers after the match, but he will have known full well that that would bring more and wider criticism, so I just don’t buy that. He hasn’t got rid of his zero hour contracts despite the bad press, he hasn’t changed tactics on his company and stock purchases despite criticism, so why do people think he will sell because of a protest. He will leave when someone offers him sufficient readies for him to think it worth while. I don’t have a problem with people protesting, and I back the stance, but I seriously doubt it will have any impact on him at all. Ciaran…Devishly handsome? Check. Super Intelligent? Check. Did I read there is a NUST meeting tomorrow? How do these things work, is there a particular agenda? Ruddy/Ibiza…anyone who is appointed a manager or something similar in a huge business is not a symptom! …a person who is accountable is not a symptom. Maybe it is the words and meaning you confuse? If we finish in 11th place and Ashley fails to sack Pardew then the club will clearly have gone back on the statement that top 10 was the MINIMUM target. Better to protest against something realistic and tangible rather than simply demand that Ashley leaves our club (which he owns). Since when have protests like these ever had a positive affect on a club? Demand something clear. Proper DoF/Chairman/MD to be appointed and Pardew to 100% be removed if we finish 11th and promise a serious review of his position regardless (which IMO should result in him getting fired). Then demand we sign someone to replace Cabaye, Remy and LDJ at a minimum this summer, along with anyone else who might leave. Seems so simple to me. Jesper…For me, it is as simple as Pardews inabilities as a manager are a direct symptom (result) of our owners ambitions for the club. If the owner had higher ambitions, we’d have a better manager. Surely we can agree that the word symptom is allowable? To be clear, I’m not saying that he therefore is not accountable as manager, he definitely is. now ask yourself, why should the fans back a man who has let them down ? TDSarf…So would you say then that if we finish 11th and if Pardew is not fired then would be the time to protest against Ashley? Can I then ask, what if he doesn’t? Or, what if he does, but hires another spectacularly underwhelming schmuck? The reason I ask, as I’m sure you’re aware, I have absolutely no faith left in Ashley or his intentions for this club. I believe he has used “reasonable” arguments to lower expectations, however these arguments are not genuine. That is just my opinion though. I’m just wondering whether those who say we need to wait will always be saying that or is there a time where we actually stand up to him, regardless of whether we think we can win? Following the near miss with relegation last season and Pardews inability to utilise the full squad, would you buy him more players? Or, for reasons with long explanations, would you perhaps give him another season to turn it around? Although Pardew might just achieve top 10, he has not provided consistent performances throughout the season and retained the trust of the supporters. Having given him a chance Ashley should now relieve him of his duties, before the Liverpool game. …surely he is a problem just like Ashley. Just because Ashley can and won’t sack him doesn’t make Pardew less of a problem? Arsenal were literally in first or second gear all game. It was a bit like seeing 11 Berbatovs (I do like Berbatov, just the running effort I mean) for the pace of their game. Like when we were beaten 6-0, Pardew will look as stupid as ever writing in his note pad and looking busy by giving still passing on useless instructions. I wish people would stop banging on about this top 10 minimum requirement meaning AP should be sacked. We are currently 9th. I can see us finishing 10th, but no lower realistically. I am getting to the point where I just want something to change. I feel though, this is exactly what Ashley wants. A quick change of manager and the reset button has been hit. I get the feeling by focusing solely on Pardew, we’re setting ourselves for another loop on this roller coaster. Yee Hah! Jesper…I don’t see what being a symptom has to do with the severity of accountability? Mind, I am a little ditzy right now after having Catchy agree with me. There is a NUST meeting tomorrow night to discuss the land-sale issue and how we as fans can oppose it. can, and should be held accountable for his mistakes. I’ve always maintained that doing the right thing doesn’t become wrong simply because you think you may not succeed. I’ve never thought about the probability of succeeding, but protesting against Mike Ashley, as well as trying to look for alternatives to his ownership is the right thing to do, and that is why I do it. How would I encourage others to join in? With that self same message – it is the right thing to do. are charlton a top club?